Designed by Manuel Quesada Mendiola and originally opened as a 9 hole course, Sensol Golf Club is now a full 18 hole course. The course is an easy walking course with well designed parkland like holes meandering their way through the bottom of the valley. The course has big well protected greens, tight fairways and clever integration of the lakes to ensure that accuracy is at a premium and the course can offer a challenge to even the best of golfer. Generally well maintained and with the backdrop of Murcias stunning mountain ranges the course offers a challenge in a lovely setting. After the previous management gave up, the new management team are really trying. They have taken a ten year lease and actually started paying the ground staff, so there is starting to be some improvement to the course. It is clear that the reason this club has not been as busy as it should was due to previous ways, ie, the price was too high, the Pro was definitely not 'up to par' and the ground staff were badly treated. These same ground staff are now working hard on bringing the course back to life. Instead of the brown fairways of last year, the area is mostly green. Greens are pretty true, but might not be as fast as you think....or are they! Fairways are in good condition. Unfortunately the bunkers are poor - complete lack of sand, but the plus side of this, is that you can putt out of nearly all greenside ones. Try not to venture off the fairways where there is scrub to the sides as your ball may either be lost or 20 foot below you. There are a couple of blind shots, but a staight drive should not cause a problem, What may cause an added problem is the ice plant that is beginning to establish itself. There are a couple of OB areas that you would not really expect to be there as they are part of the property, but, hey that's life! There is plenty of water to avoid, but again should cause no problem with staight drives. 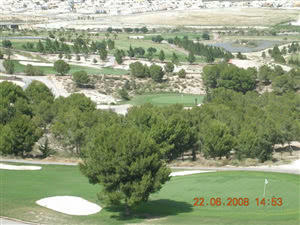 The thirteenth is a very simple par 3, tee off (from a hill top) over some scrub to the (another hill top) green. Did I mention that straight drives would cause no problem? Sorry forgot the prevailing wind... comes up the valley from the Med, and gets to it's worst around 5 to 7 each evening - better keep those drives arrow like!